Joseph Hurt (??) 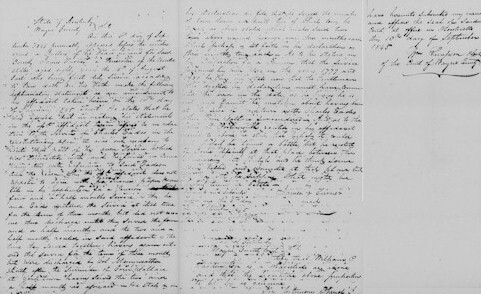 J. P.
The declaration of Sarah Eades for a pension certified on the 21th day of December 1843 by Joseph Hurt Justice of the Peace for said county being submitted to the court it doth approve his proceeding and act in said case also hereby direct the clerk to endorse this approval on the papers. Know all men by these presents, Know all men by these presents, That I Jacob Eades the son and heir at law of Sarah Eases elect the widow of Charles Eades deceased who was a Soldier in the Army of the Revolution, do hereby constitute and appoint J. H______ my true and lawful Attorney for me and in my name to prosecute against the Government of the United States, before any Department thereof, any and all claim or claims that have to arrears of pay or Pension money, under any Act or Acts, Resolution or Resolutions, of the Congress of the United States, and especially the Acts 4th July 1836, 7th July 1838, 3rd March 1843, 17th June 1844, 2nd February 1848, and 29th July 1848 – as well as the more ancient Acts of 18th March 1818, 15th May 1828, and 7th June 1832. Said Attorney is moreover authorized in my name to demand at any Department of said Government, a re-consideration of any decision hitherto or hereafter to be given, touching upon my interests, and to obtain from any Department or archives thereof, any and all information or evidence of whatever character relating to or in anywise bearing upon the claim or claims we hereby seek the investigation of. 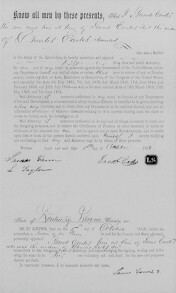 Said Attorney is moreover authorized to do any and all things necessary to carry out the foregoing purposes, and to receive the Certificates of pension or other character of drafts or evidences of the amounts due me and to appoint one or more Sub-Attorneys, and to confer upon him or them all the powers therein conferred upon himself. I hereby ratifying and confirming all that my said Attorney may do by virtue of these presents. State of Kentucky Wayne County sec. 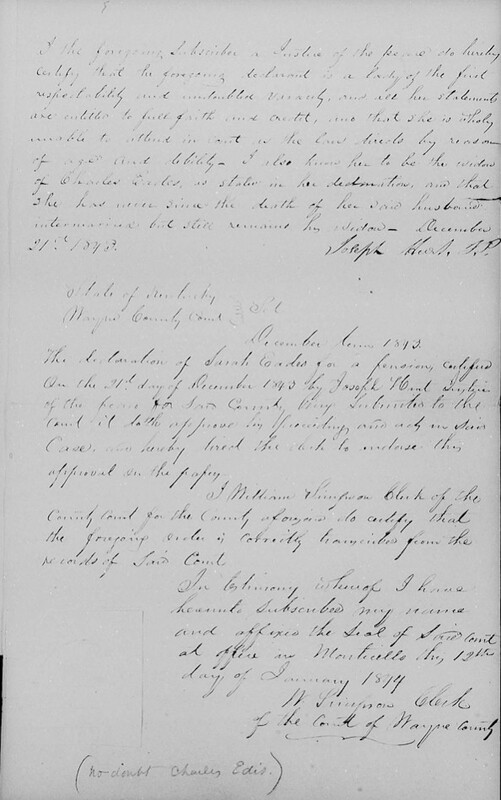 BE IT KNOWN, that on the 5th day of October 1852, before the subscriber, a Justice of the Peach in and for the County and State aforesaid, personally appeared Jacob Eades heir at law of Sarah Eades decd. Who was the widow of Charles Eades decd. 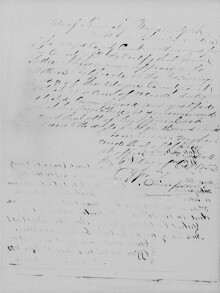 Subscribers to the foregoing Power of Attorney, and acknowledging the signing, sealing and delivering the same to be his own voluntary act and deed for the uses and purposes therein set forth. 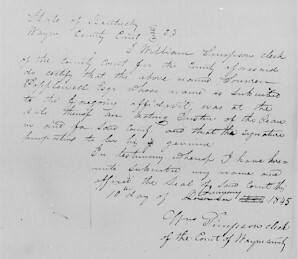 IN TESTIMONY WHEREOF, I do hereunto subscribe my name, James Gann J. P.
John Daugerty age 72 eyars makes the following affidavit to wit that he was well acquainted with Charles Eades decd who was in the Revolution also his wife Sarah Eades decd go acquainted with them about the year 1800 or thereabout and from the age of their oldest child I would suppose they were married in 1785 or 1786 Have often heard the afsd Charles Eades speak about his service in the Army of the Revolution. 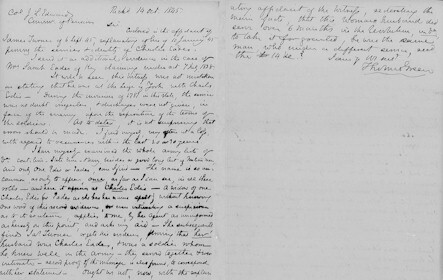 The afsd Charles Eades decd on the 3rd day of May 1823 and left Sarah Eades his widow who died on the 25th day of September 1852 and left Gabriel Eades, Nancy Eades, Polly Hurt, Jacob Eades, Ruth Dancy her only surviving children and he further declares that the afsd Sarah Eades remained a widow up to the time of her death and it was always believed amongst the neighbors that the afsd Sarah Eades was the widow of Charles Eades decd whose nam eis on the certificate for £14 6s and 4d at the War Department at Federal City. They were looked upon as people of great respectability and veracity. 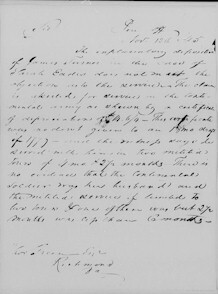 James Gann Sr age 80 years makes the following affidavit to wit that he was well acquainted with Charles Eades decd who was in the Army of the Revolution also his wife Sarah Eades decd have known them upward of forty years and they were always considered man and wife in the neighborhood in which they lived. 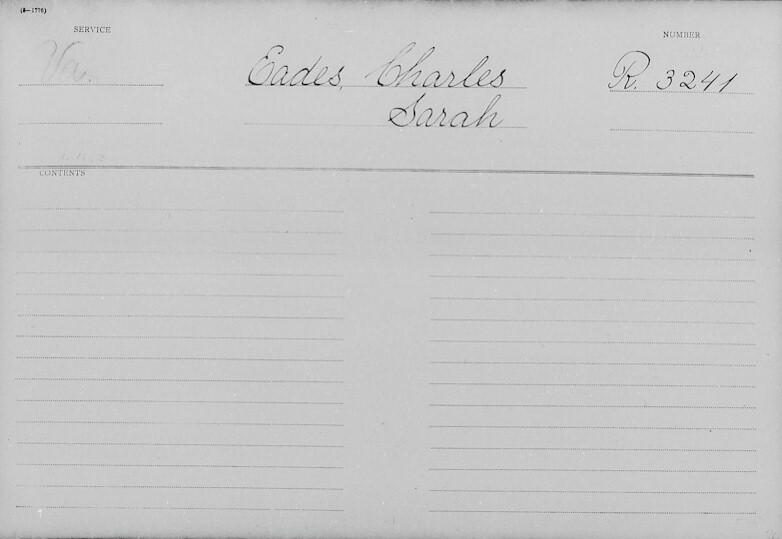 The afsd Charles Eades died on the 3rd day of May 1823 and left Sarah Eades his widow who died on the 25th day of September 1852 and left Gabriel Eades, Nancy Eades, Polly Hurt, Jacob Eades, Ruth Dancy her only surviving children. 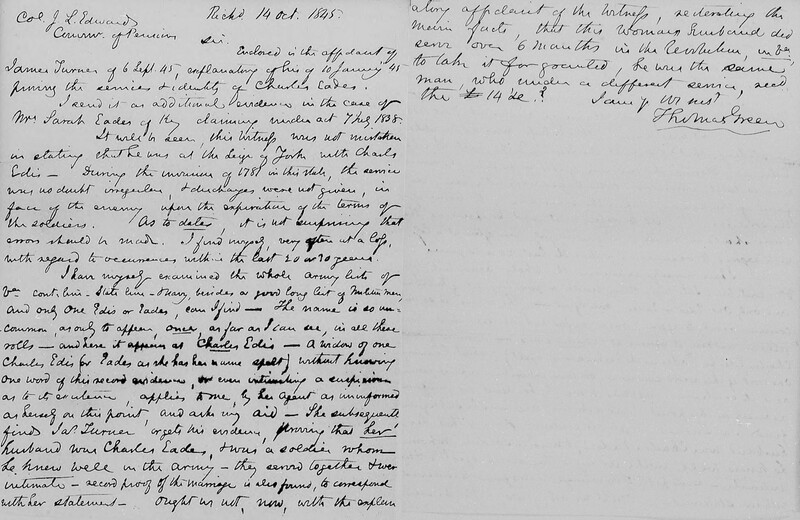 He further declares the afsd Sarah Eades lived a widow up to the time of her death. They were looked upon as persons of great respectability and veracity among the neighbors with whom they associated with. I the above magistrate do certify that the two above declarants are personally known to me and that they are gentlemen of respectability and veracity to whose statements the fullest faith and credit should be placed. To Wit: that he is the child of Sarah Eades deceased who was the widow of Charles Eades decd who was a soldier in the Army of the Revolution. He has often heard his father speak of his services rendered with the Army of the Revolution also heard other soldiers conversing with him about their hardships and the many struggles they had encountered during the war. Think that his afsd father entitled first from the State of Maryland and then from the State of Virginia, don’t recollect well the name of his officers being such a long time ago. 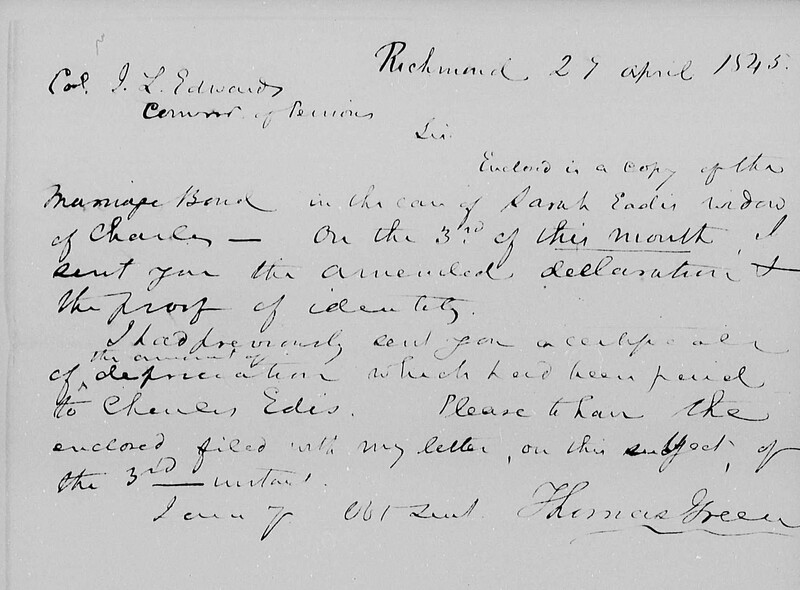 Have often heard him (the afsd Charles Eades decd) speak about being paid off with Continental money which proved to be worthless also heard him speak about some English currency think the amount was £14 6s and 4d and think that he received that amount which was the only money which could be made use of. He has heard this afsd father say that his name was on the roll at the war department for £14 6s and 4d. 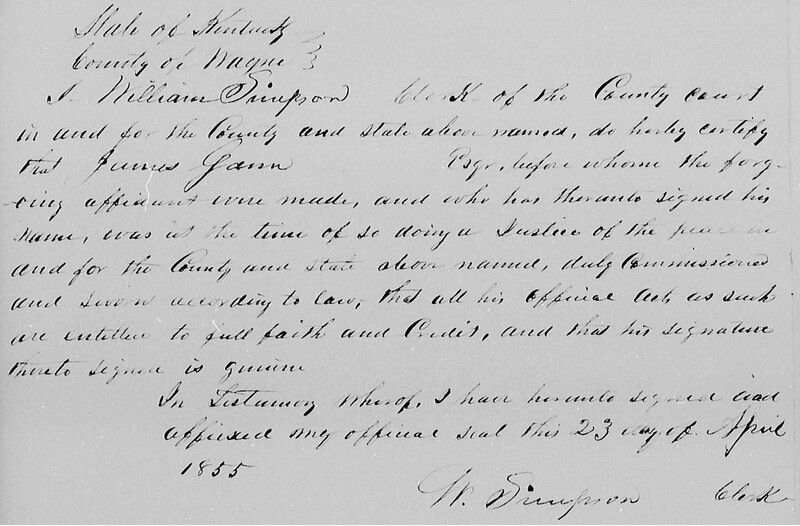 His afsd father died 3rd day of May 1823. Think they were married in State of Virginia or Maryland after the war was over, in the year 1785 or 1786 at the record of the children ages will prove. 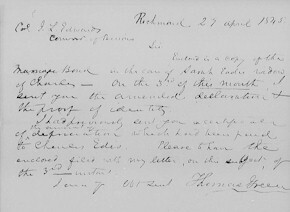 His afsd mother (Sarah Eades) died on 25th day of September 1852 and left Gabriel Eades, Nancy Eades, Polly Hurt, Jacob Eades, Ruth Dancy her only surviving children. 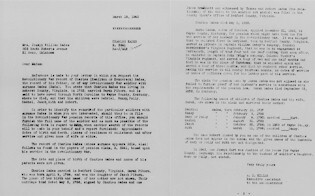 He further declares his afsd mother (Sarah Eades) remained a widow up to the time of her death. I, the just subscribed Magistrate do certify that the above Declared is presently known to me and that he is a gentlemen of truth and respectability in whose statements the fullest faither and credit should be placed. 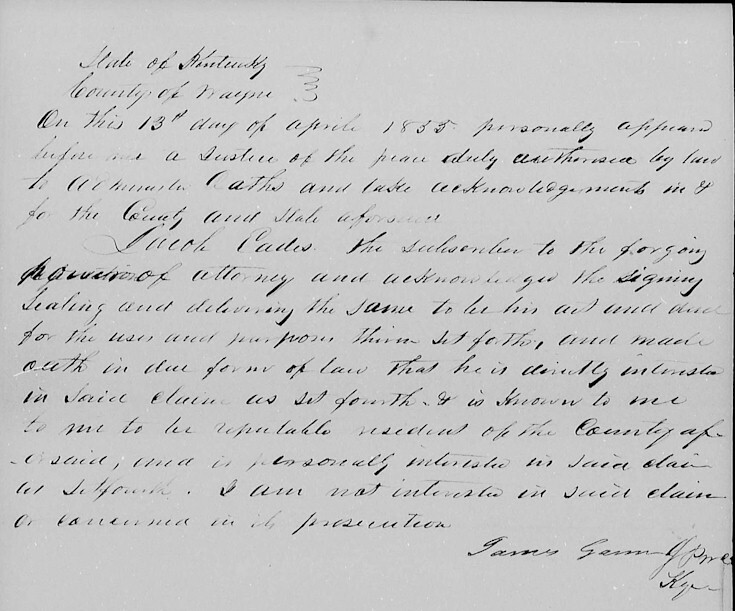 I William Samford Clerk of the Wayne County Court in and for the County and State aforesaid, do certify that James Gann is an acting Justice of the Peace in and for the County duly commissioned and sworn and that his signatures above written are genuine. I John L. Sallee Judge of the County Court of the County and State aforesaid Do certify that it was on this day satisfactorily appeared to me that Charles Eades who was a soldier in the Army of the Revolution died on the 3rd day of May 1823 and left Sarah Eades his widow who died on the 25th day of September 1852 and left Gabriel Eades, Nancy Eades, Polly Hurt, Jacob Eades, Ruth Dancy who are her only surviving children. 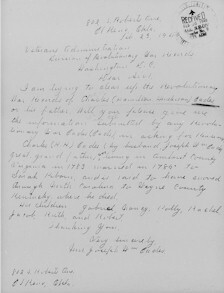 Reference is made to your letter in which you request the Revolutionary War record of Charles (Hamilton or Henderson) Eades, the record of his father , or of any Revolutionary War soldier with the surname Eades (Eads). 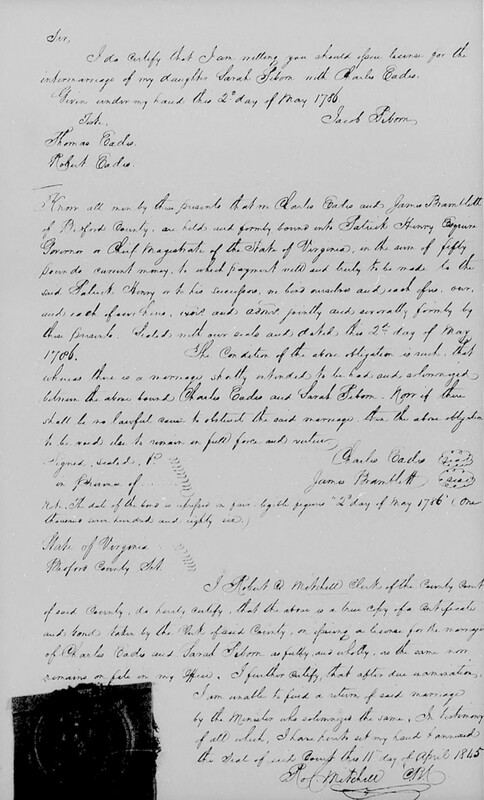 You state that Charles Eades was living in Amherst County, Virginia, in 1783, married Sarah Piborn, and is said to have moved through North Carolina to Wayne County, Kentucky, where he died, and that his children Gabriel, Nancy, Polly, Rachel, Jacob, Ruth and Robert. 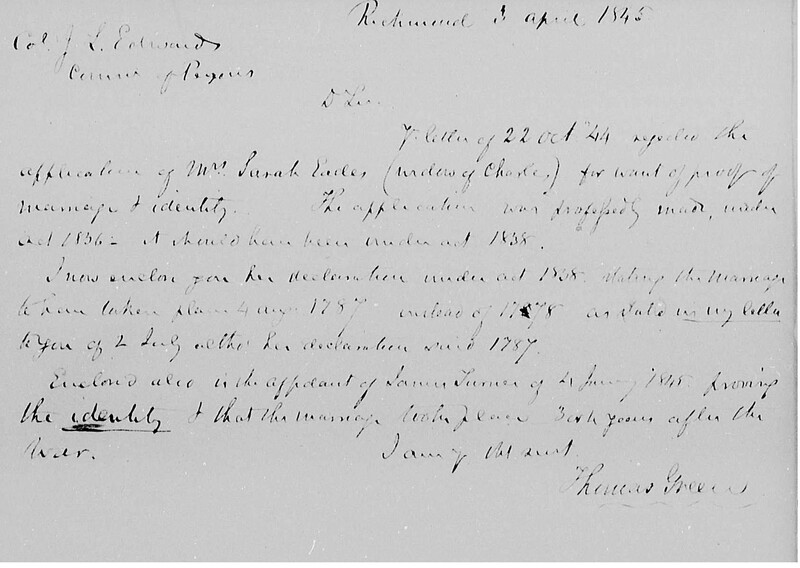 In order to identify the records of the particular soldiers with surname Eades in whom you are interested, should they be on file in the Revolutionary War Pension records of this office, you should furnace the full name of the soldier and as much as possible of the following data in regard to such, when another search of the records will be made in your behalf and a report furnished: approximate date of birth and death, places of residence at enlistment and after service and given name of wife or widow. 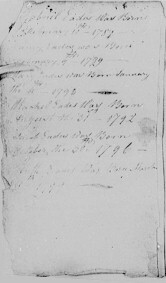 The record of Charles Eades (whose surname appears Edis, also) follows as found in the papers of pension claim, R. 3241, based upon his service in the Revolutionary War. 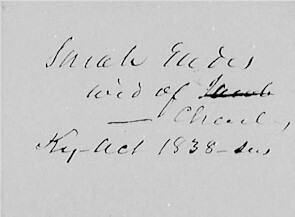 The date and place of birth of Charles Eades and names of his parents were not given. 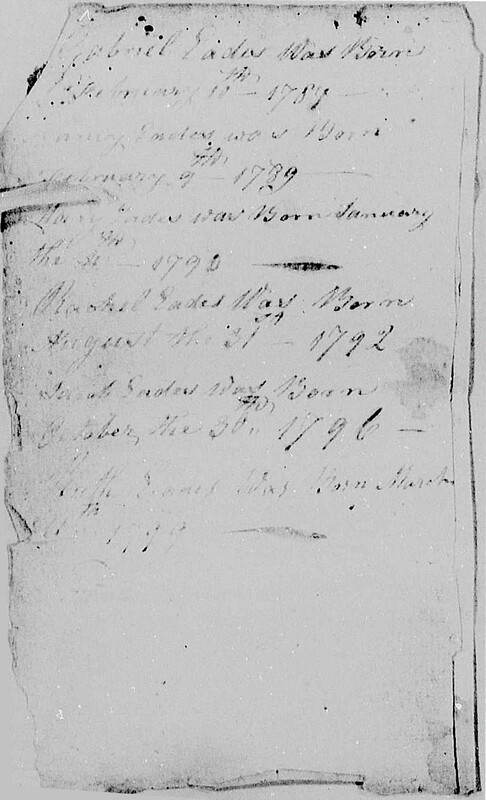 Charles married in Bedford County, Virginia, Sarah Piborn, who was born April 9, 1764, and was the daughter of Jacob Piborn. The place of her birth and name of her mother are not shown. 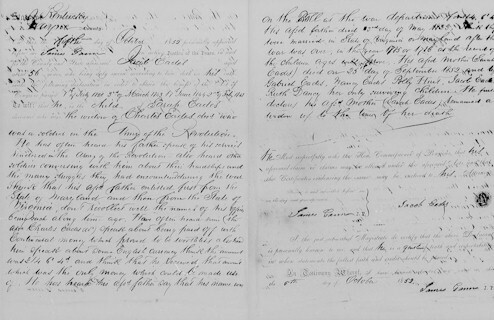 Their marriage bond dated May 2, 1786, signed by Charles Eades and one James Bramblett and witnessed by Thomas and Robert Eades (the relationship of the three to the soldier not stated) was filed in the County Clerk’s Office of Bedford County, Virginia. 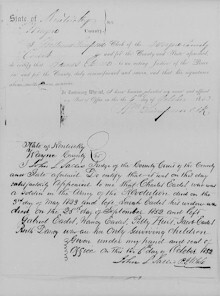 Sarah Eades, widow of Charles, applied December 21, 1843, in Wayne County, Kentucky, for pension which might have been due for the service of her husband in the Revolutionary War. It was alleged that he enlisted first in Maryland, then in Bedford County, Virginia, served as private in Captain William Oatey’s company, Colonel Merriwether’s Virginia regiment, that he was in an engagement at Portsmouth, length of tour four and one half months; that soon after, he enlisted in Captain John Trigg’s company, Colonel Tucker’s Virginia regiment, and served a tour of two and one half months and that he was in the Siege of Yorktown; that he enlisted again and served a tour of three months, and that he rendered other service, making his service in all nearly thirteen months, no dates of service or names of officers give for the latter part of his service. The claim for pension made by Sarah Eades was not allowed as she failed to furnish proof of her husband’s service in accordance with the requirements of the pension law. 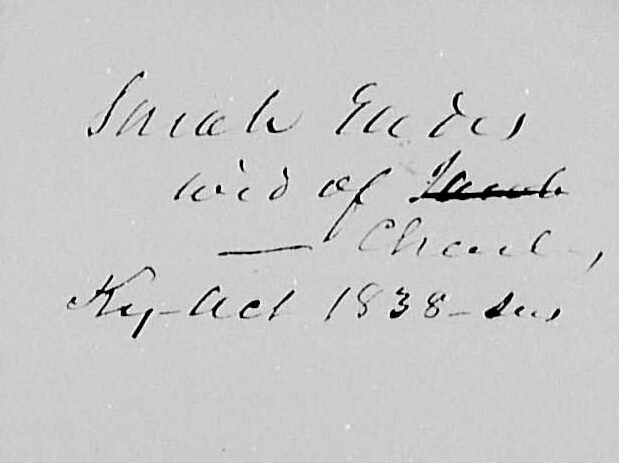 Sarah Eades died September 23, 1852, in Kentucky. 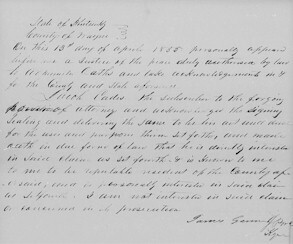 Jacob Eades born October 30, 1796; in 1852 of Wayne Co., Ky. 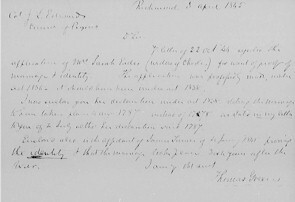 The name Robert listed by you as one of the children of Charles Eades does not appear in the claim, and the give names of the husbands of Mary or Polly and Ruth are not designated. 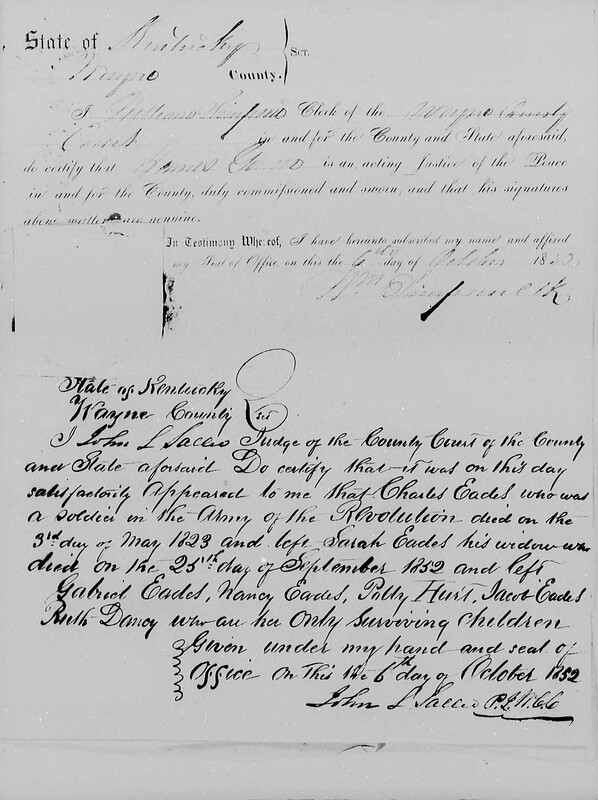 In 1843, one Joseph Hurt was Justice of the Peace for Wayne County, Kentucky; his relationship to the husband of soldier’s daughter, Mary or Polly, not stated. I do certify that I am willing you should issue license for the intermarriage of my daughter Sarah Piborn with Charles Eades. Given under my hand this 2nd day of May 1786. 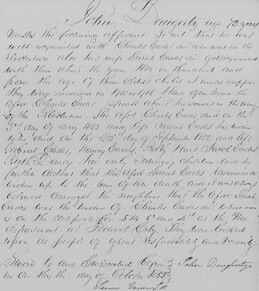 Personally appeared before the undersigned a Justice of the Peace in and for the county aforesaid James Turner a pensioner of the Unites States aged Eighty years the 15th day of August next who being first duly sworn according to Law, do the on his oath make the following statements viz that he was well and intimately acquainted with Charles Eades from the time he was a small boy or lad to the time of his death, that the said Charles Eades & himself served together as soldiers in the revolutionary war, they entered the service together in the County of Bedford in the state of Virginia under William Oaty as their captain, Mennyweather as their Col. & Muhlenburg as their General. They were both at the battle of Portsmouth and served four months and a half in the service this tour and were discharged. They again in a short time entered the service together under Capt. John Trigg, the Col who commanded the regiment to which they belonged was named Tucker, this tour they served together upwards of two months and a half having been at the siege of York and were again discharged by Col. Tucker,. 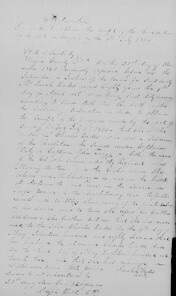 He states that the said Charles Eades again entered the service for the further term of three months and served out his time and returned home. 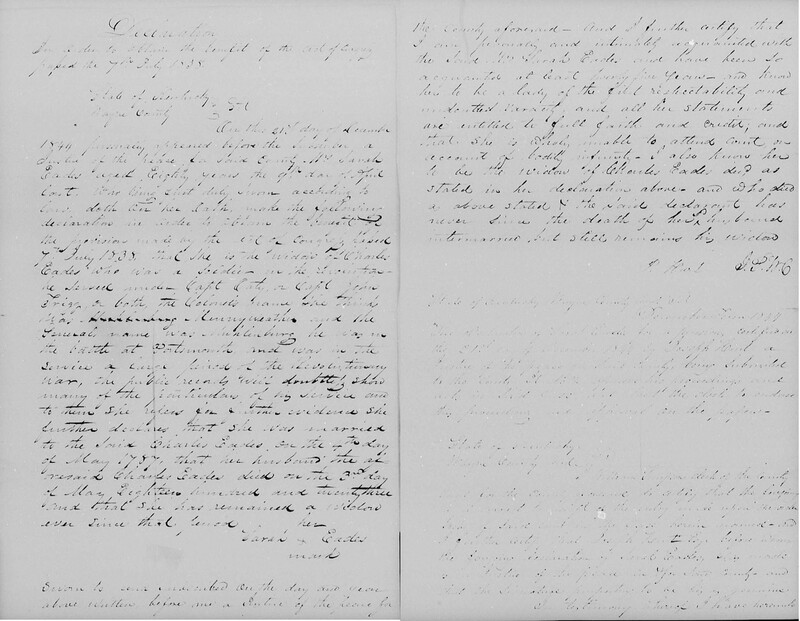 He thinks the said Eades performed other service in said war but cannot specify further than he has above stated but always understood from said Eades that he served in all near thirteen months at various times in said war. 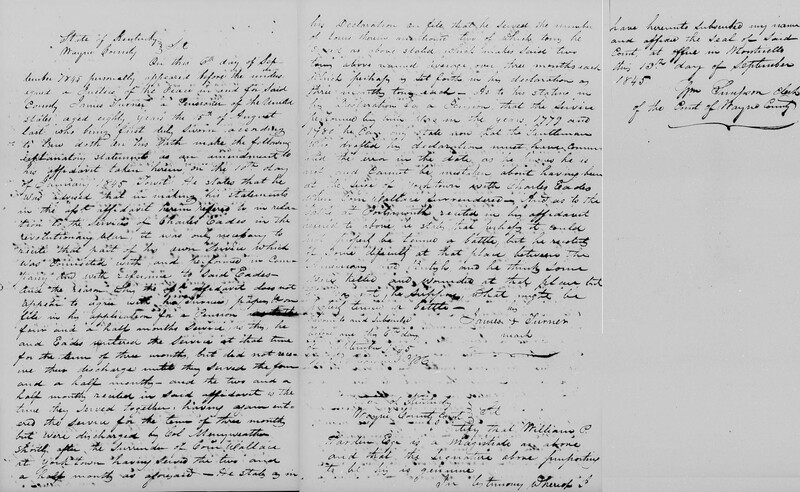 He states that the said Charles Eades was married to his wife Sarah (who is now a widow) in the County of Bedford in the state of Virginia some three or four years after the close of the revolutionary war. 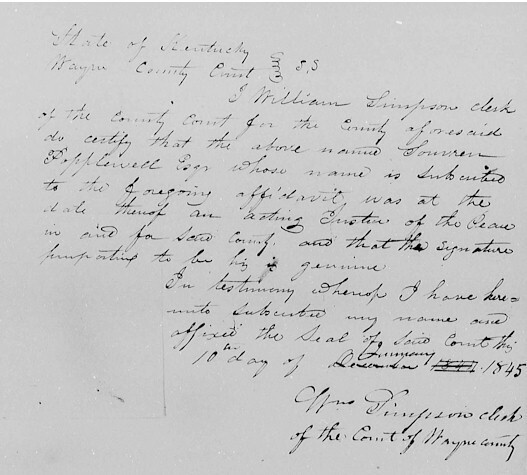 He further states that he was very intimately acquainted with the said Charles Eades & wife Sarah up to the death of the said Charles which took place in the year 1823 in the County of Wayne and State of Kentucky as he now re_____ and that he has even since that period resisted in the neighborhood of the said Sarah Eades, and knows her to be the widow of the said Charles, and that she has remained his widow ever since his death. 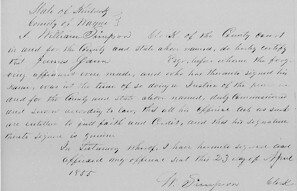 I William Simpson clerk of the county court for the county aforesaid do certify that the above named Souvren Popplewell Esqr whose name is subscribed to the foregoing affidavit was at the date thereof an acting Justice of the Peace in and for said county, and that the signature perportive to be his is genuine. 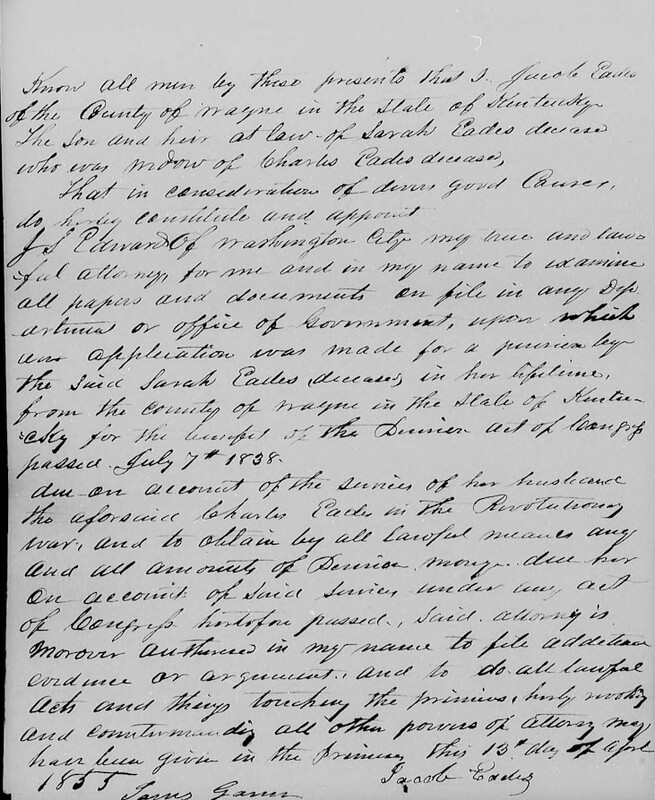 Know all men by these present that I Jacob Eades of the County of Wayne in the state of Kentucky the son and heir at law of Sarah Eades deceased who was the widow of Charles Eades deceased. 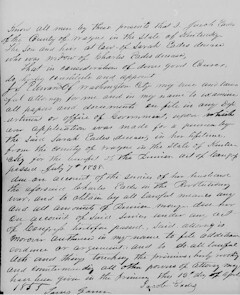 Jacob Eades the subscriber to the forgoing power of attorney and acknowledged the signing sealing and delivering the same to be his act and did for the uses and purposes therein set for this and made oath in due form of law that he is directly interested in said claim as set forth. It is known to me to be respectable resident of the county aforesaid and is personally interested in said claim as set forth. I am not interested in said claim or concerned in its presentation. 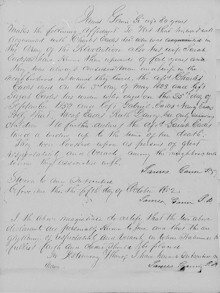 I William Simpson Clerk of the County court in and for the county and state above named, do hereby certify that James Gann Esqr. 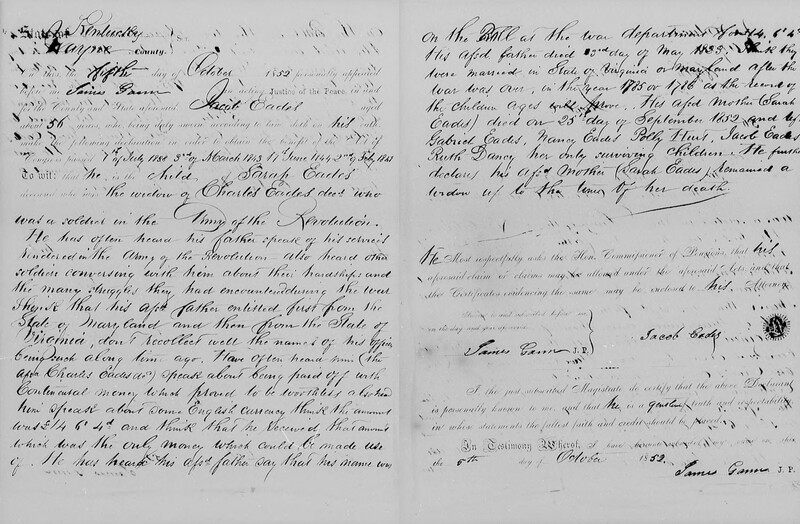 Before whom the forgoing affidavit were made, and who has thereunto signed his name, was at the time of so doing a Justice of the Peace to and for the county and state above named, duly commissioned and sworn according to law, that all his official acts as such are entitled to full faith and credit, and that his signature thereto signed in genuine. 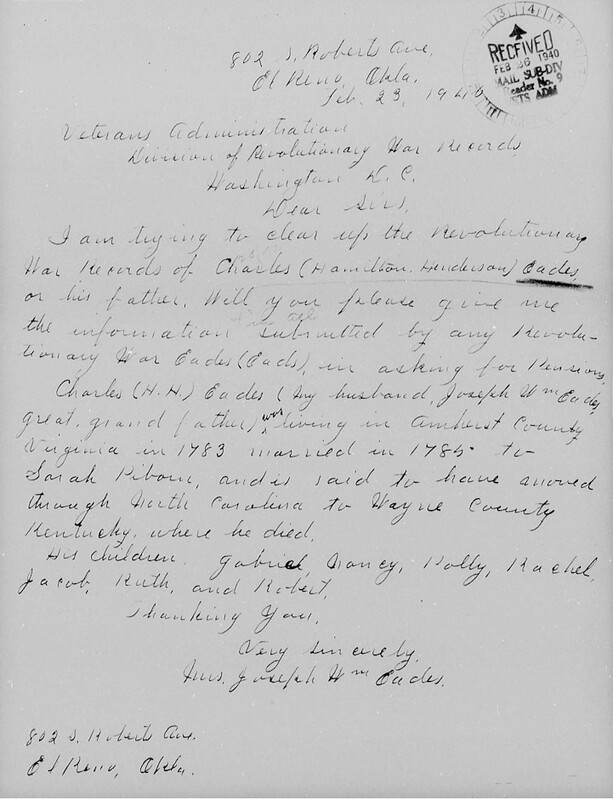 Enclosed is the application of Mrs. Sarah Eades widow of Charles Edis, a soldier of the Va line. She was married 4 August 1778. 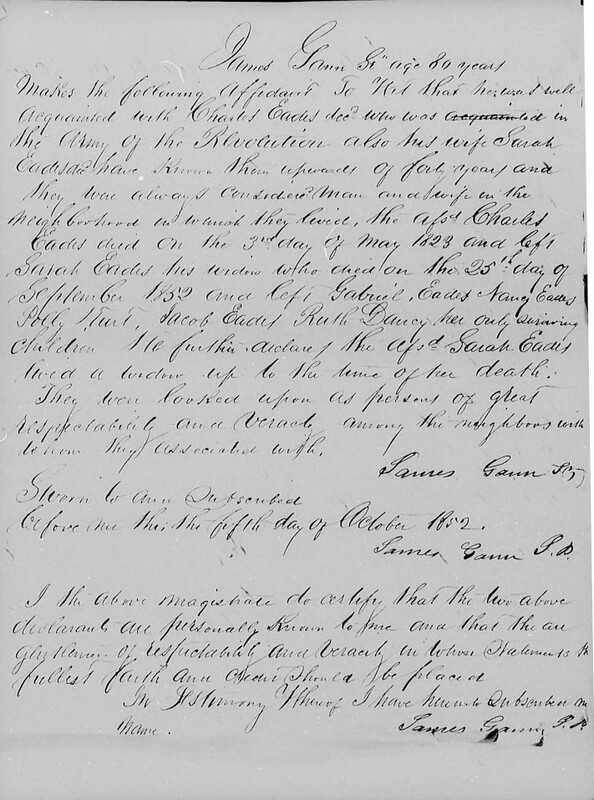 It appears she received an certificate for £14 6s and 4d as a soldier of infantry in Va. Cont. line. The proof of marriage may have been sent to your office. She now resides in Wayne County, Ky.
Sir In the case of Sarah Edis no evidence whatever is offered in ______ of her allegations as to the date of her marriage or the identity of her husband with the soldier of his name who rec. a depreciation certificate for £14.6.4. showing a service in the Va. Line of 10 or 12 months. 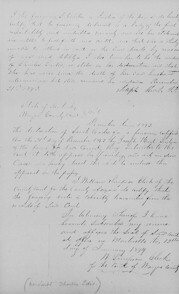 The first may be supplied by the records of the clerks office issuing the license & the other by her husbands comrades or by old respected neighbors who may have a record of his reputation as a soldier. 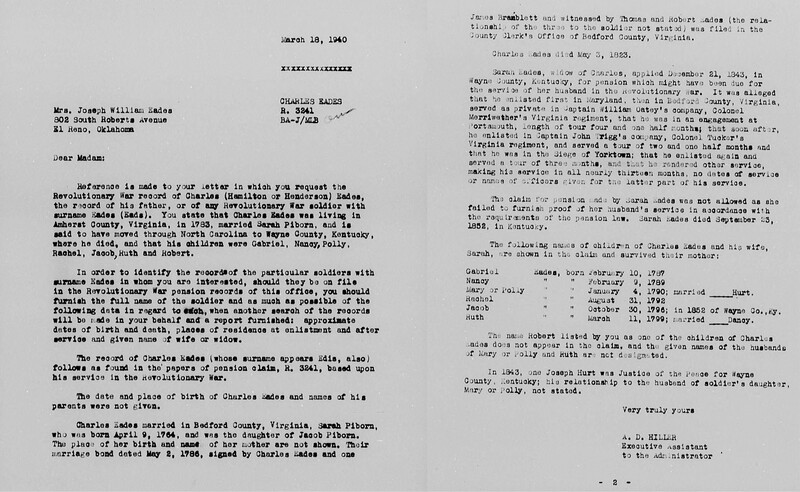 Enclosed is the affidavit of James Turner of 6 Sept 45, explanatory of his 10 January 45 _____ the ___ & identity of Charles Eades. 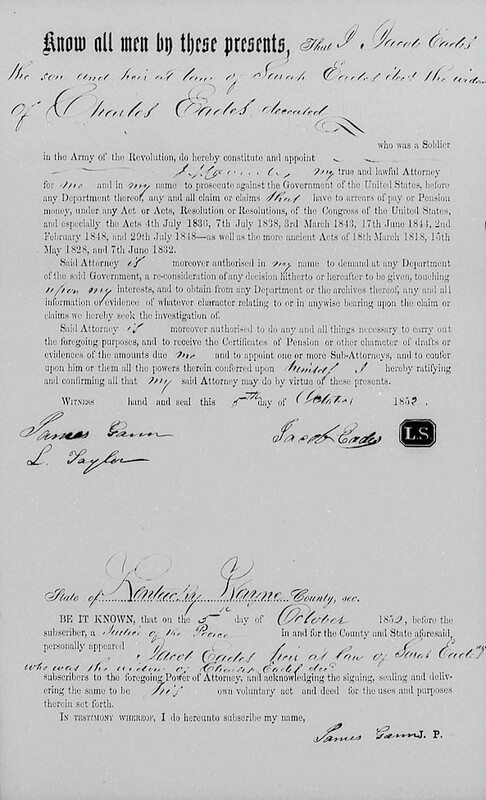 I send it as additional evidence in the case of Mrs. Sarah Eades of Ky claiming under act 7 July 1838. It will be seen this witness was not mistaken in stating that he was at the siege of York with Charles Edis – During the invasion of 1781 in this state, the service was no doubt irregular & discharges were not given, in face of the enemy upon the expiration of the terms of the soldiers. As to dates, it is not surprising that errors should be made. I find myself very often at a loss with regard to occurrences with the last 20 or 30 years. 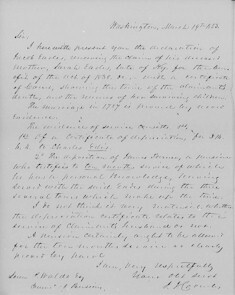 I herewith present you’re the declaration of Jacob Eades, receiving the claim of his deceased mother, Sarah Eades, last of Ky. for the ____of the Act of 1838 _____ with a certificate of court, showing the time of the claimants death, and the names of her surviving children. 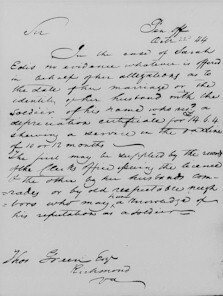 The marriage in 1787 is proved by record evidence. 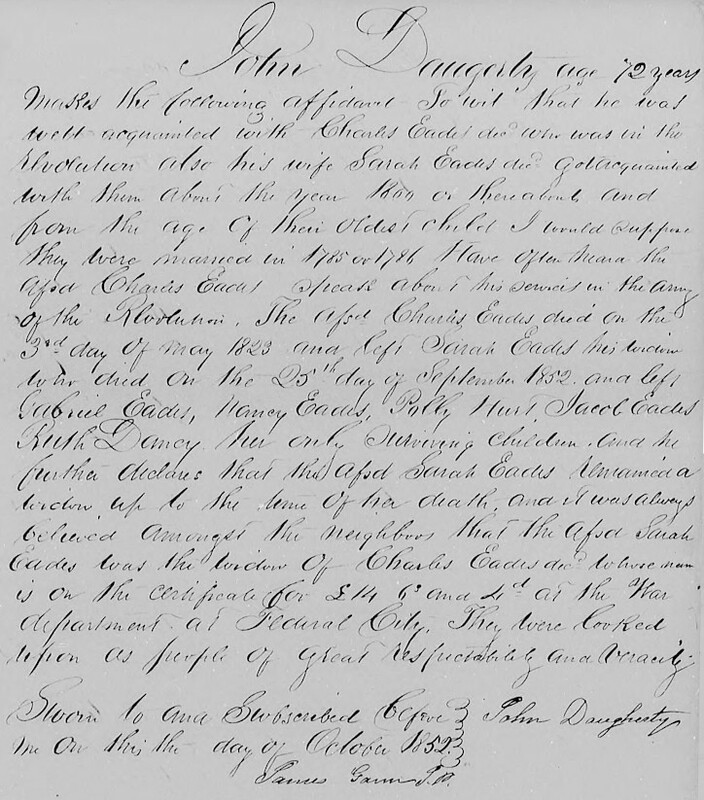 2nd The deposition of James Turner, a pensioner who testifies to ten months service of which he has a personal knowledge having served with the said Eases during the three several tours which make up the time. I do not think it necessary material whether the declaration certificate relates to ____ service of claimant husband or not. It is somewhat discouraging to find claims rejected, for want of evidence or certain _____, when I know the husband & most conclusive testimony have been forwarded to the office. I do not write to complain or I know papers will sometimes get misplaced. 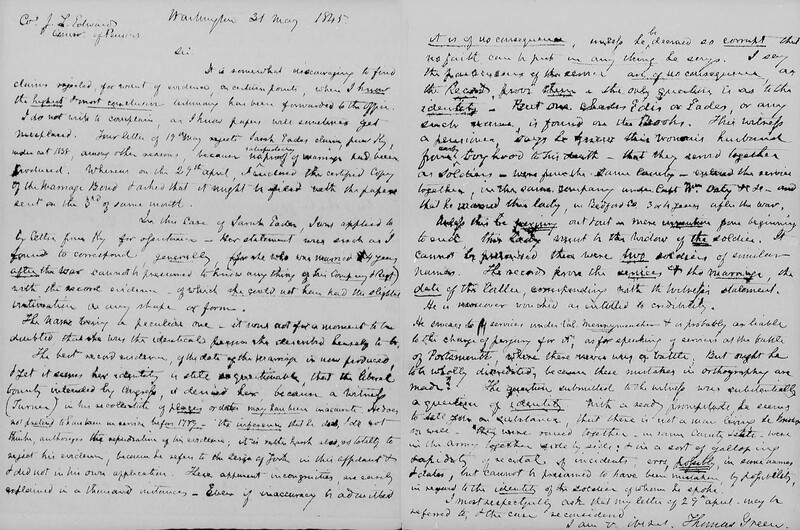 Four letters of 19 May rejects Sarah Eades claim, from Ky, under Act 1838, among other reasons, because no satisfactory proof of marriage and been _____________. Whenever on the 29th April I enclosed the certified copy of the marriage bond & asked that it might be filed with the papers sent on the 3rd of same month. 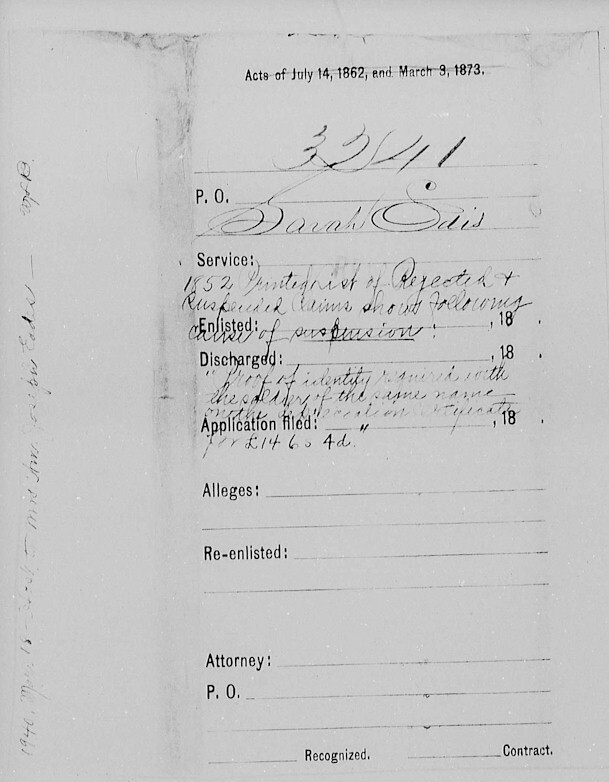 In the case of Sarah Eades, I was applied to by letter from Ky for objections Her statement were such as I found to correspond generally (for the who was named 4 years after the war cannot be presumed to know anything of his company & regt) with the record evidence of which she could not herein know the slightest _____ in any shape or form. The name being a peculiar one – it was and not a moment to be doubted that she was the identical person the described herself to be. 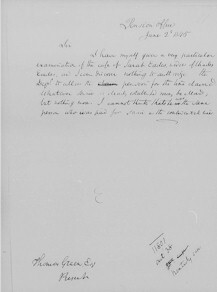 The best record evidence, of the date of the marriage in new produced & yet it seems her identity is still questionable that the liberal bounty intended by Congress is denied her because a witness (Turner) in his recollection of places or dates may have been inaccurate. He does not pretend to have been in service before 1779. The inference that he did, I do not think authorizes the ____ his _____; it is rather hard, as totally to reject his evidence, because he refer to the Seige of York in this applicant & did not in his own application. These apparent incongruities are easily explained in a thousand instances - Even if inaccuracy had _____ It is of no consequenced unless he be deemed so compt that no faith can be put in anything he says. 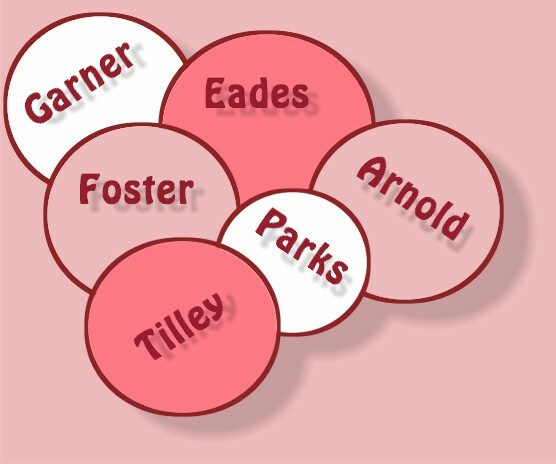 I say the particulars of the ____ and of no consequences, as the record proves these & the only ____ is as to the identity – But one Charles Edis or Eades, or any such name, is found in the Books. 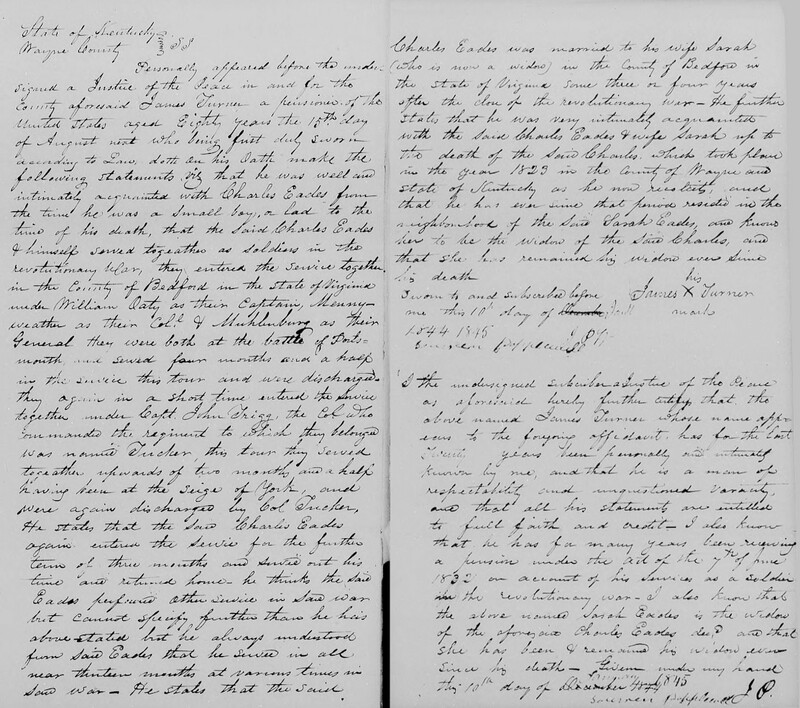 This witness a pensioner says he knows this woman’s husband from early boyhood to his death – that they served together as soldiers – were ___ the same county - enlisted this service toghether in the same company under Capt Wm. Oaty ____ and that he married this lady, in BedfordCo 3 or 4 years after the war. Unless this be perjury out & out – mere conjecture from beginning to end this lady must be the widow of the soldier. It cannot be _____ those were two soldiers of similar names. 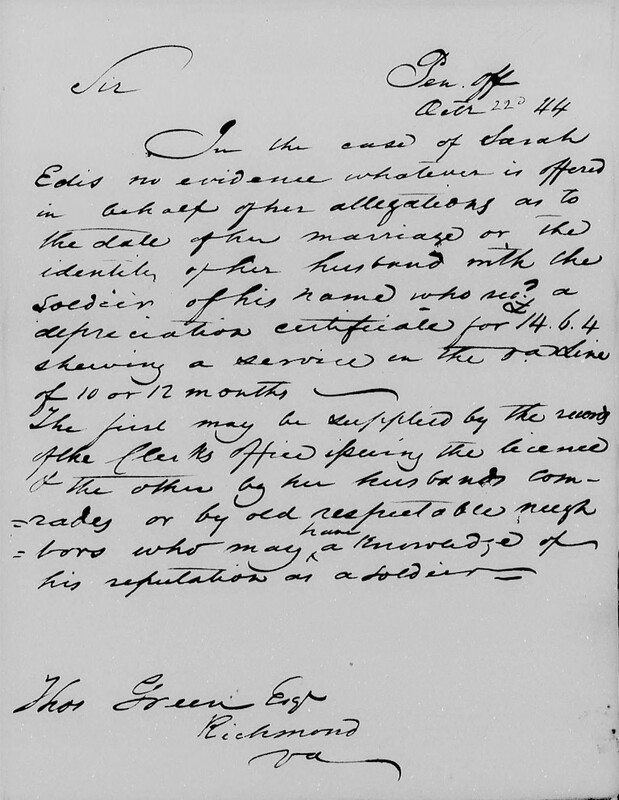 The record proves the services & the marriage the date of the latter corresponding with the witness statement. He is moreover ___ as entitled to credibility. He ____ to ___ service, under Col Merryweather & is probably an liable to the change of perjury for it, as for speaking of services at the battle of Portsmouth, where there never was a battle. But out he both wholly ______ because these mistake in orthography are made? The question submitted to the witness were subitanticall a question of identiy. ___ a ____ _____, he seems to tell ____ ___ substandce, that there is not a man born to ____ ___- well – They were ___ together in ___ county ___ were in the Army together side by side & in a sort of galloping rapidly of ___ of incidents, ____,______ in the same anemes & _____, but cannot __ ______ to have been mistaken, but dup_____, in regard to the identity of the soldier of whom he spoke. 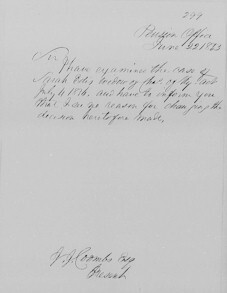 This is to certify, that it appears from a List of this Office of such Officers and Soldiers of the Virginia Continental Line, during the Revolutionary War, as settled their Accounts, and received Certificates for the balances of their Full Pay, according to an Act of Assembly, passed the November Session 1781, that a Certificate issued on the 12th day of May 1784, in the name of Charles Edis as a soldier of infantry for £14.6.4, which Certificate appears to have been delivered to Col. Cabell and was given for services prior to the 1st January 1782. 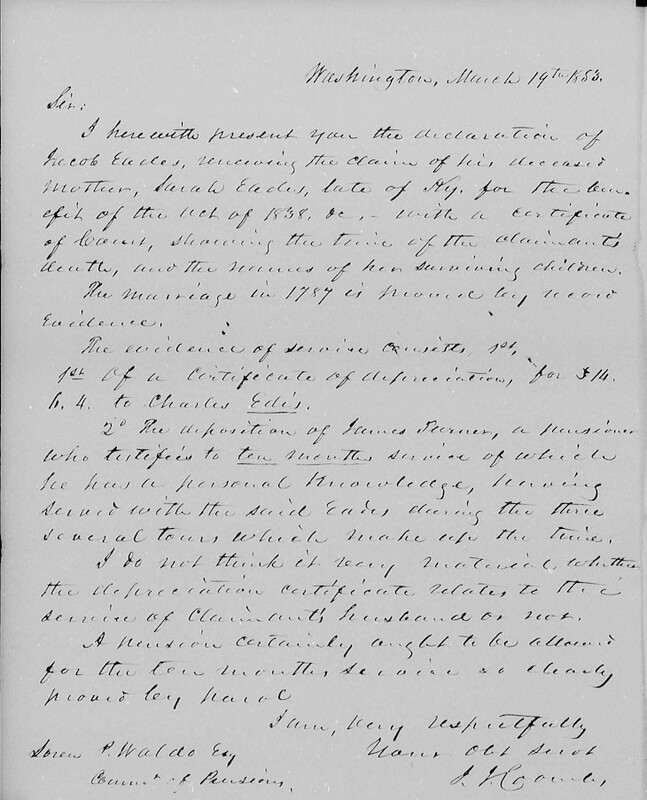 On this 6th day of September 1845 personally appeared before the undersigned a Justice of the Peace in and for said county James Turner a pensioner of the Unites States aged eighty years the 5th of August last who being first duly sworn according to law doth and his oath make the following explanatory statements as an ammendment to his affidavit taken herein on the 10th day of January 1845 To Wit: He states that he was advised that in making his statements in the first affidavit herein referred to in relation to the services of Charles Eades in the revolutionary war, it was only necessary to recite that part of his own service which was connected with and performed in company and with reference to said Eades and the reason why the first affidavit does not appear to agree with his services, papers (Turners) on file in his application for a pension four and a half months service rather, he and Eades entered the service at that time for the term of three months, but did not receive this discharge until they served the four and a half months and the two and a half months recited in said affidavit is the time they served together, having again entered the service for the term of three months but were discharged by Col. Merryweather shortly after the surrender of Corwallis at York town having served the two and a half months as aforesaid. 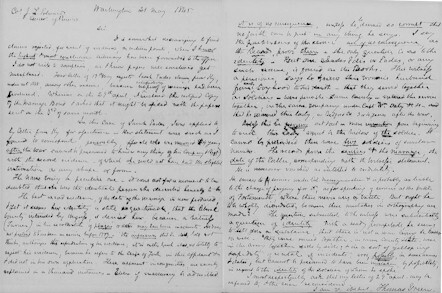 He states again the declaration an file that he served the number of terms therein mentioned two of which terms he served as above stated which makes said two terms above named average over three months each which perhaps is set forth in his declaration as three months terms each. 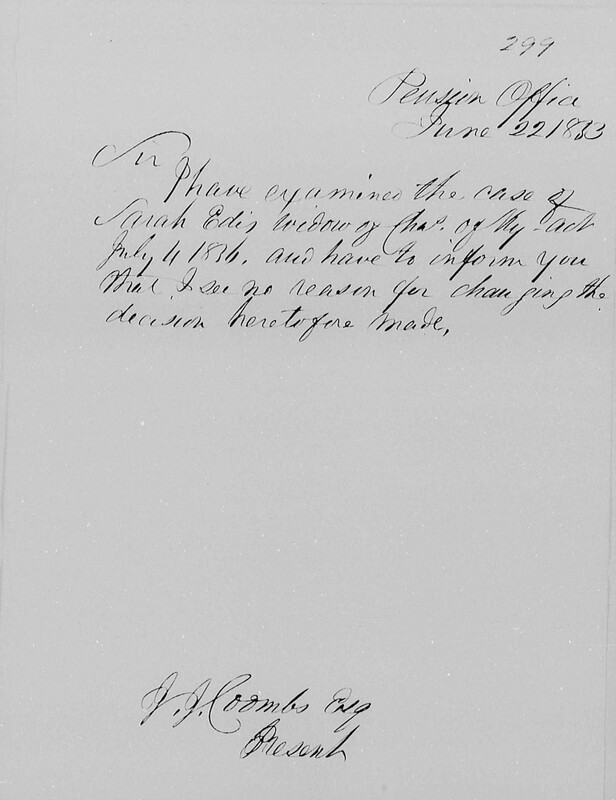 As to his stating in his Declaration for a pension that the service performed by him was in the years 1779 and 1790 he can only state now that the Gentleman who drafted his declaration must have committed the error in the date as he knows he is not and cannot be mistaken about having been at the siege of Yorktown with Charles Eades when Cornwallace surrendered . 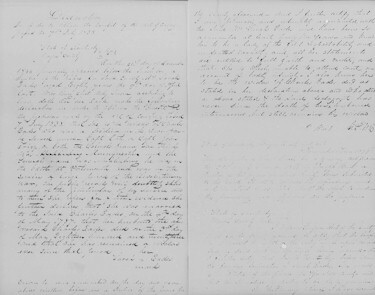 And as to the battle at Portmouth recited in his affidavit referred to above, he state that perhaps it could not properly be termed a battle, but he recollects of town definitely at the place between the ____ and _____ and he thinks some were killed and wounded at that place but was not, he suffices, what might be perfectly termed a battle. 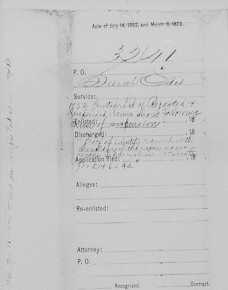 Enclosed is a copy of the marriage bond in the case of Sarah Eadis widow of Charles – on the 3rd of this month. I sent you this amended declaration & the proof of identity. 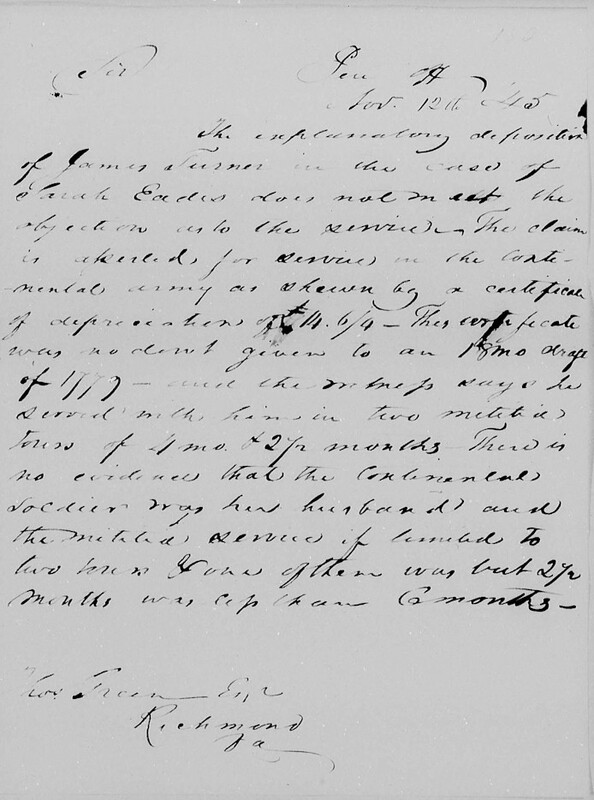 Dear Sirs, I am trying to clear up the revolutionary war records of Charles (Hamilton Hutchenson) Eades, or his father. 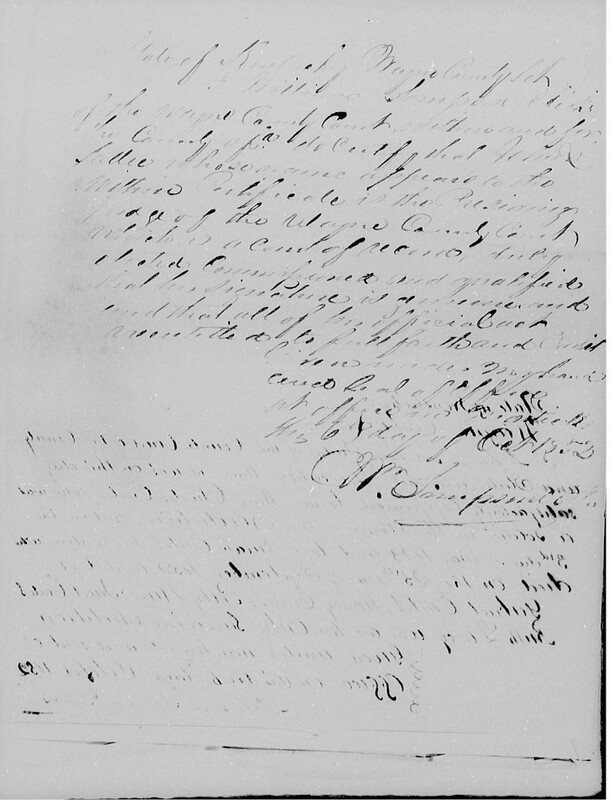 Will you ____ give me the information submitted by any revolutionary war Eades (Eads), in asking for pensions. Charles (H.H.) 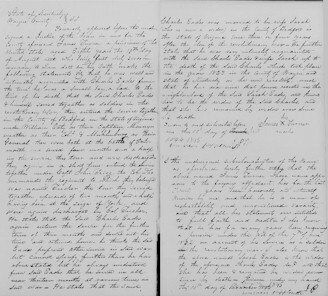 Eades (my husband, Joseph Wm Eades, great-grandfather was living in Amherst county Virginia in 1783 married in 1785 to Sarah Piborn, and is said to have moved through North Carolina to Wayne county Kentucky, where he died. His children Gabriel, Nancy, Polly, Rachel, Jacob, Ruth and Robert. 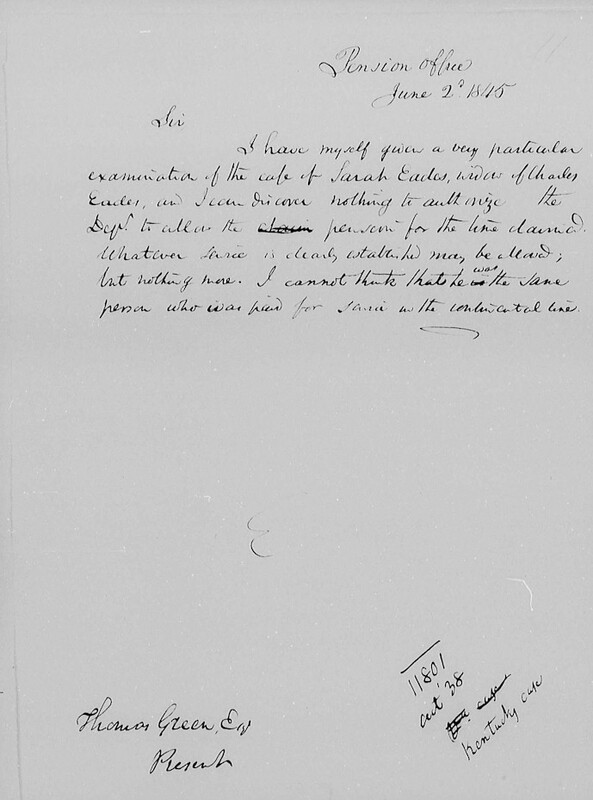 On this 21st day of December 1844, personally appeared before the subscriber a Justice of the peace for said county. 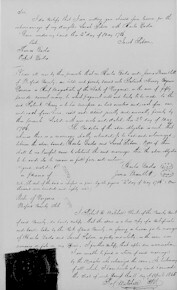 Mrs. Sarah Eadis aged eighty years the 9th day of April last were being first duly sworn according to law doth on her oath make the following declaration in order to obtain the benefit of the pension made by the Act of Congress published 7th July 1838 that she is the widow of Charles Eades who was a soldier in the revolution he served under Capt. 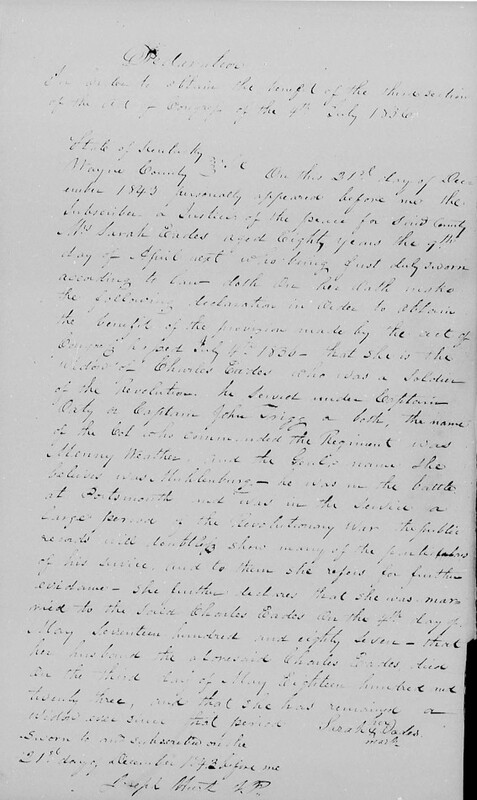 Oaty or Capt John Trigg or both the Colonels name she thinks was H______ Merryweather and the General name was Muhlinburg he was in the battle at Portsmouth and was in the service a large period of the Revolutionary War, the public records will doubtedly show many of the particulars of his service and to them she refers for further evidence she further declares that she was married to the said Charles Eades on the 4th day of May 1787 that her husband the aforesaid Charles Eades did on the 3rd day of May Eighteen hundred and twenty three and that she has remained a widow ever since that Period.